I've done some minor sniffing around since I can across this book at the library the other day. 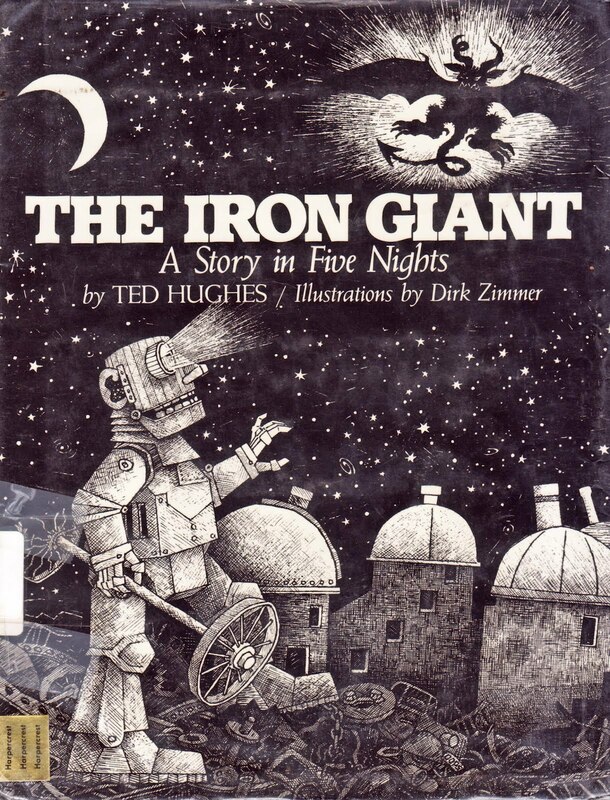 Penned by renowned poet (and one-time husband to Sylvia Plath), it's the original novel that inspired the Brad Bird animated, 1998 film classic, The Iron Giant (one of my all-time favorite animated movies). 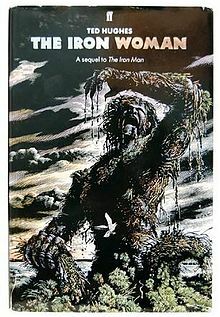 Now, some folks on the internet seem to think the title of the book was changed from Man to Giant after the movie was released, but the version I have is from 1988 - ten years before the movie was released - and already there was a shift in the title. Not sure for what reason, but if anyone has any ideas, I'd love to know. The Iron Giant came to the top of the cliff. How far had he walked? Nobody knows. Where had he come from? Nobody knows. How was he made? Nobody knows. Taller than a house, the Iron Giant stood at the top of the cliff, on the very brink, in the darkness. 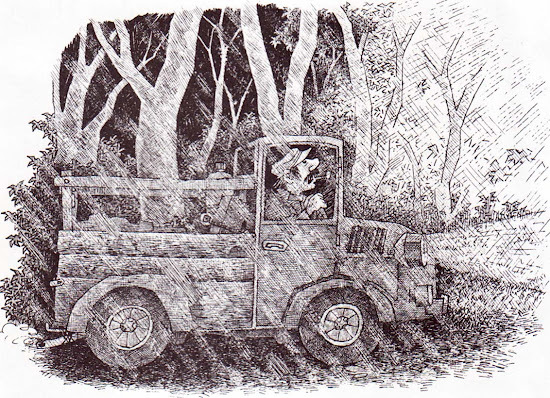 >Originally published in 1968 by Faber & Faber with drawings by George Adamson, the story is told in five chapters that make up five nights. 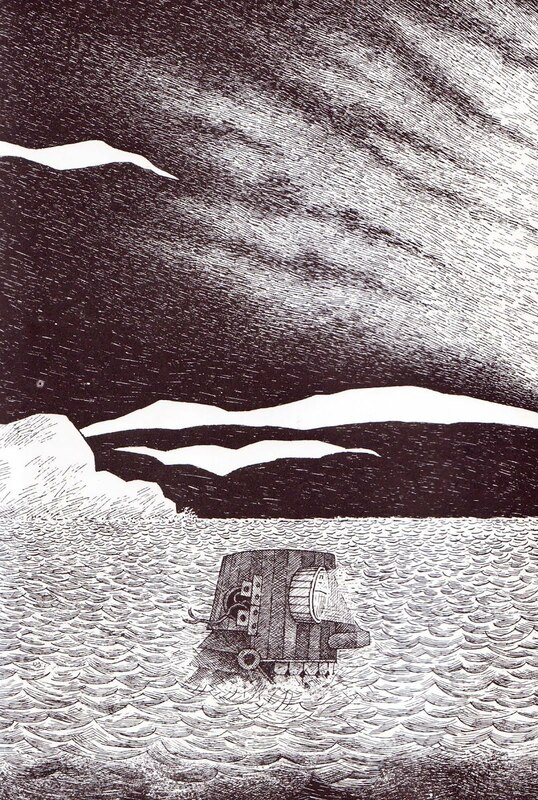 The theme of the book is vaguely similar to that of the film, in that the giant does eat metal and is befriended by Hogarth, a young boy, and is left to live in a junk yard where he can eat scrap metal to his heart's content without causing damage to the town. However, unlike in the film that is focused on a clear anti-war, anti-gun message, with the bad guys actually being the military itself... here, we find the Giant dismantled and freighted to Australia where he must participate in a battle of the wits with a creature from outer space known as the "space-bat-angel-dragon". 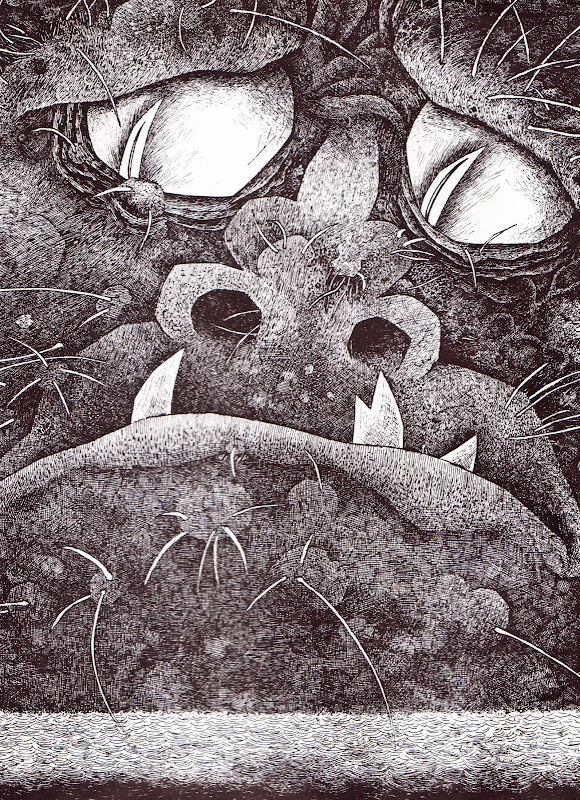 The book has been re-illustrated a few times, and while I haven't seen the original version (out of my price range), these black and white etchings by the German-born artist, Dirk Zimmer, are pretty awesome. Hughes even wrote a sequel called The Iron Woman, published in 1993. 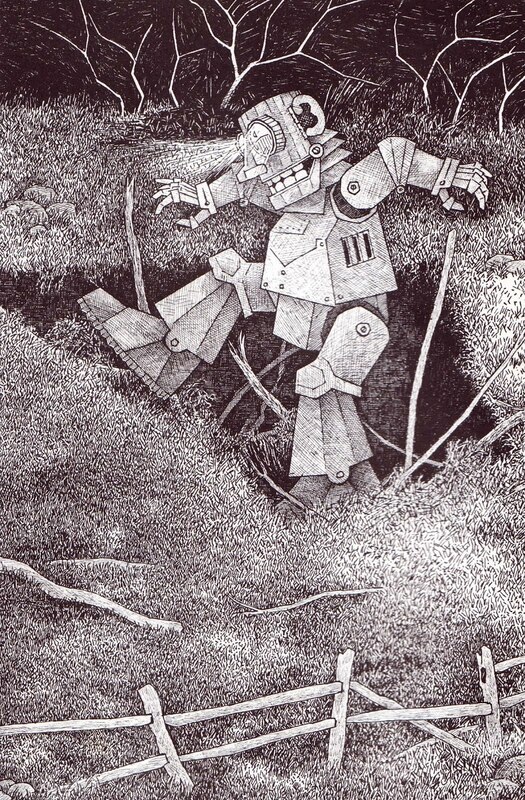 From the Wiki: "The Iron Woman has come to take revenge on mankind for its thoughtless polluting of the seas, lakes and rivers" says the introduction to the novel. It references reverse sexism, in that the iron woman exacts her revenge on a seemingly ignorant/uncaring male community (in the waste disposal plant) for polluting the area in which she lives." Girl power to the ultimate extreme. Looks cool! I would imagine that Marvel Comics had something to do with the title being changed. Ahh.. the Iron Giant. I cannot count the amount of times I have heard Jennifer Aniston shout "Hogarth!". Such a good movie. Are those the illustrations in the copy that's in print now, I wonder? Anyway, great post. Via Wikipedia: "Prior to publishing in North America, the title was changed to The Iron Giant (as were all references to the metal man) to avoid confusion and legal issues with Marvel Comics' character, Iron Man." I LOVE this movie, too. I have always meant to check out the book, although I'm waiting for the daughters to be a bit older. Gotta say, though, I'm a big Ted Hughes fan, but after reading the book I still think Brad Bird's vision of the story is the best. That bloody movie turns me into a tear factory every time. I've never seen this version. I like the illustrations. I don't actually like the books very much. 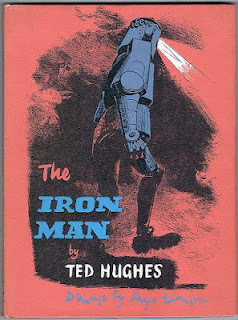 Re: the title, the UK publication by Faber & Faber was under the title The Iron Man, while the US publication by Harper & Row was under the title The Iron Giant. I suppose the title was changed for the US market, although both have publication dates of 1968 so there wasn't much delay between them. i wonder if this is the cover, with a different illustrator? anyone have it? The artwork is exceptional. I love that style, but you don't see that anymore. I wonder about what Dan said above. Marvel may have influenced the title to be changed. Stories at this time for children seemed a lot darker, I think of Roald Dahl. Fantastic Mr. Fox is my personal favorite, and the movie was incredible. I love your blog. Just discovered it today. Did not know there was a book behind the movie THE IRON GIANT. You do learn something new everyday! !